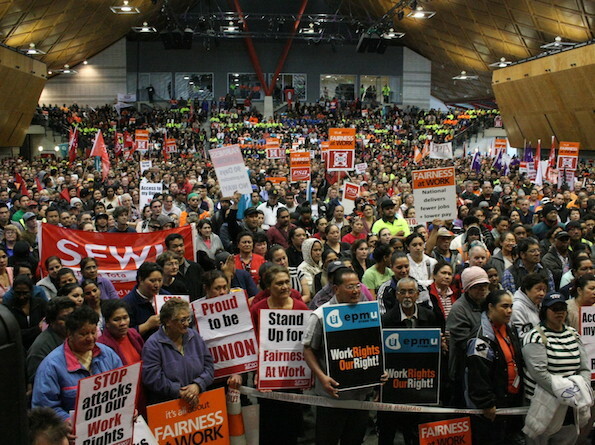 20,000 union members rally on 20 October 2010 to protest the first round of National’s attacks on workers’ rights. On Thursday 16 May the Council of Trade Unions (CTU) National Affiliates Council meets in Wellington. On their agenda will be the latest attacks on workers’ rights being pushed through by National and the CTU’s newly launched campaign Why Cut Our Pay. The cuts are targeted attacks on specific unions. The removal of the obligation to collective bargaining will first be used to allow Ports of Auckland to break off negotiations with the Maritime Union and break down job security for hundreds of wharfies. The removal of collective agreement protections for workers in the first 30 days of their job is an attempt to further casualise the service and retail industry workforce and allow unfair dismissals of workers starting off. The attacks on multi-employer bargaining will be used against nurses to break up their nationwide collective agreement. The CTU represents some 350,000 members in over 35 unions. It is the single biggest democratic organisation in the country and its members work across the country in positions as diverse as bus drivers, nurses, scientists and fire fighters. Without the physical and intellectual labour of these workers the country would grind to a halt. Prisons, schools and hospitals would be unstaffed. Airports, ports and transportation networks would be shut down. Government departments, retail stores and cleaning companies would find their work hobbled. The unions which must take the lead on these attacks are the three unions that will be first and most severely affected. The Maritime Union, the Nurses’ Organisation and the three main service and retail unions, First Union, SFWU and Unite should all push the CTU on 16 May for a national day of action to fight these changes and commit to a joint stop work to rally the fight against National’s employment relations policy of cutting workers’ rights and pay. The union movement needs to stop mucking about and get its members organising again to fight the government. The Nats are happy to pick unions off one by one as long as workers don’t start generalising their workplace problems with others and start realising their very real power. Teachers worried by charter schools, doctors by lengthening waiting lists, building workers facing poor health and safety, supermarket workers facing youth rates need to rub shoulders in the streets. Between now and joint union action we need a massive co-ordinated education campaign by the CTU unions not just explaining these attacks but arguing for a new deal on employment relations with industry awards from a centre-left government after 2014. But the focus of this education campaign must also be mobilisation that defends our current work rights but also builds and mobilises union power. What unions do now against the government will set the scene for 2014. Defeating the Nats is going to need the support of thousands of mobilised union members who can enrol their friends and whanau to vote, get them to the polls on polling day, give out leaflets, put up posters and talk politics with their workmate. This cohort of experienced activists cannot be created from thin air. It has to be built over weeks and months. In Australia it was the union movements Your Rights at Work campaign that brought down the John Howard’s right-wing government in 2007. But it wouldn’t have happened without sustained education and mobilisation of union members from the beginning. Without the aggressive campaign workers’ rights in Australia would have been severely weakened. That’s why the CTU’s National Affiliates Council meeting on 16 May naming the date for a stop work meeting to stop National and committing to a sustained campaign to destabilise the National government is absolutely essential. So it seems the CTU National Affiliates Council meeting yesterday could not agree on a national day of action. But some unions will be going ahead with stopwork meetings and encouraging others to join them. If you’re in a union, contact your delegate or organiser and ask them what your union is doing!